The 85th Intercity Baseball Tournament got under way at Tokyo Dome on July 18, with 34 teams from across the country vying for the coveted Black Lion Flag. 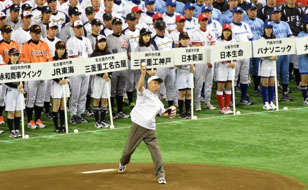 In a speech at the opening ceremony, Norio Ichino, head of the Japan Amateur Baseball Association (JABA), expressed his hope that the amateur players would demonstrate the highest-level of baseball during the 12-day tournament. Akihiko Inoue, head of Kimitsu Iron Works in Chiba Prefecture of Nippon Steel & Sumitomo Metal Corp., received the newly created internal affairs and communications minister prize on behalf of the Shin Nittetsu Sumikin Kazusa Magic club from Masakazu Sekiguchi, senior vice minister for internal affairs and communications for energizing the local community. The Incentive Award this year went to the All Ashikaga Baseball Club in Tochigi Prefecture, which is competing in the summer games for the first time in 36 years. Ashikaga Mayor Satoshi Izumi received the honorable award from Yutaka Asahina, president of the Mainichi Newspapers Co. which is co-sponsoring the tournament with JABA. Kimio Watanabe, captain of the JX-ENEOS team from Yokohama, made a pledge for fair play, saying he and other players would do their best to mark a new chapter in the 85-year history of the Intercity Baseball Tournament. After the opening ceremony, the championship began with a game between Tokyo Gas and Sendai-based 77 Bank (Shichiju-Shichi Ginko).